All too often, food reviews gush over small details about a place that mean little to most patrons. For me, I look for places in which I can feel comfortable, enjoy the food, get a good value and can bring my kids to enjoy the meal with my wife and me. Allen’s Stone Baked Pizzeria is such a place. The Butcher’s Best will appeal to any meat lover. 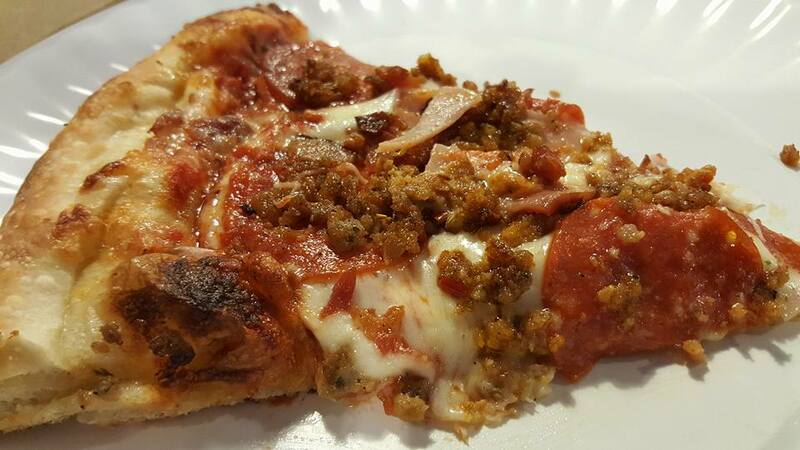 It is loaded with full flavored spiced meats like meatballs, pepperoni, bacon, ham and sausage. Photo by Doug Deal. The restaurant brings back memories of Italian and pizza places in my youth, where they were family run and catered to customers who were bringing their family. I am often disappointed by the large corporate chains, because they are sterilized of the charm that these memories invoke. On the menu are plenty of options to satisfy the occasional picky eater or two, but the highlight is the pizza. As our usual, we ordered the pizza loaded with meat, the Butcher’s Best. 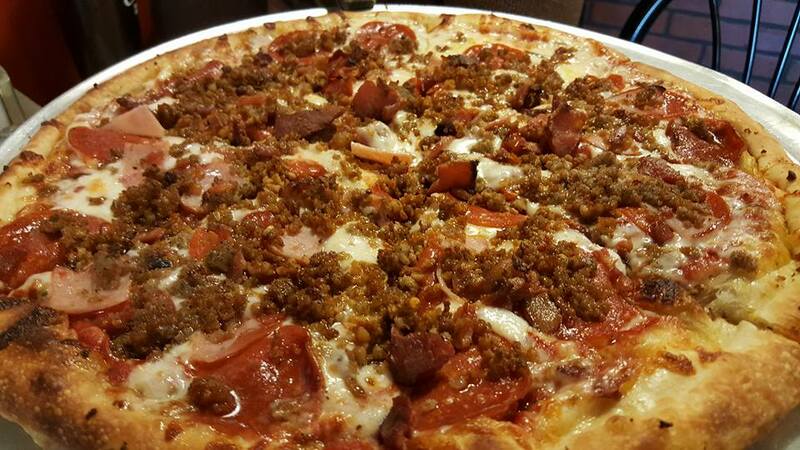 This amazing pie comes with pepperoni, ham, sausage, meatballs and bacon. The 14 inch was enough to feed our family of 4 for $15.99 and we also ordered 3 side Caesar salads for a couple bucks each. With drinks as well as the salads, our specialty loaded pizza meal bill was under $30. A slice of Butcher’s Best on a faux paper plate. The plate is actually a hard material shaped to look like old fashioned paper plates. A nice touch. Photo by Doug Deal. Crust on a pizza is a personal thing, so it is hard to recommend to another person. At Allen’s the crust is New York style, which means it is thinner and a bit “floppy” so that you fold it a little as you eat it. People used to overworked, chewy and thick crusts may not appreciate that style, but it is my personal favorite, as it is real pizza, not some toppings on a a hard to chew bread. You may be able to ask for a longer cook time for a crisper crust. I am also a fan of a healthy amount of cheese and sauce, and they did not disappoint. The spiciness of the sausage, pepperoni and meatballs mingled well with the slightly smoky and sweet flavors of the bacon and ham. It was truly one of the best pizzas I’ve had in a while and I eat it at quite frequently. 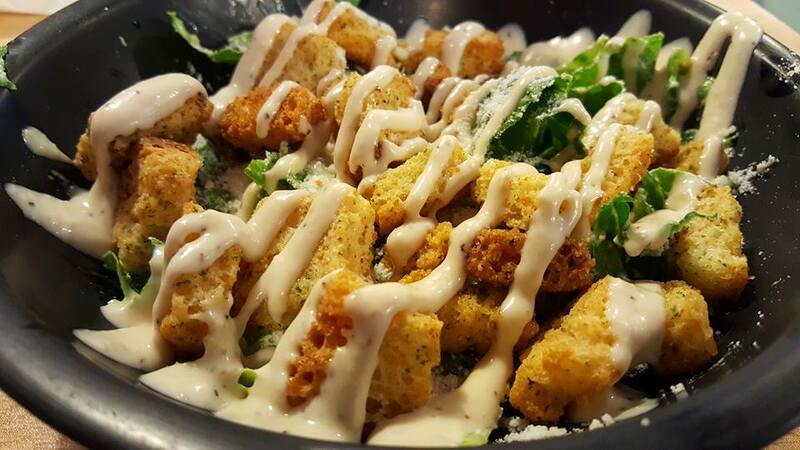 The side Caesar salad at Allen’s is a great value and tasty in its own right. Photo by Doug Deal. The salads were large for side salads and I loved the Caesar dressing. One thing that I would say could be improved is the freshness of the lettuce. We came at an off time, so they may have been cut and prepped longer than usual, resulting in a slightly wilted lettuce, but it was okay and still well worth the couple of bucks they charge. Another aspect I like about the restaurant is the fact you can get root beer from the fountain. Root beer is the perfect drink for two things, chili-dogs and pizza, and it is nice they had that on the menu. Small, medium and large mean little about the true size of a pizza, but a 14-inch cheese will run you about $11, which is a large at most places, but not all. They also have an 18-inch pizza which is approximately 60% larger for $13. For building your own, you can also choose between a marinara, pesto or white pizza sauce. Calzones, Strombolis, spaghetti, sandwiches, wings and deserts are also on the menu. You can also find lunch specials. They are open from Tuesday to Sunday for lunch and dinner. Allen’s is a great family pizza place. The restaurant in in Warner Robins at 115 Margie Dr, across from the movie theater.